It is important to note that many of the players who are currently occupying roster spots on Summer League teams will never play on a NBA team. Any analysis of a player’s Summer League performance has to take the level of competition, or lack thereof, into consideration before attempting to make any judgments. However, there are a number of items that can be taken into consideration, such as a players focus, their attention to detail, how hard they appear to be working, improvement made on identified deficiencies in their game, etc. After two games in the Summer League, I have been most impressed by the leadership skills that John Wall is exhibiting. In part, I am impressed by this because he is currently the youngest player on the team and yet players appear to be accepting of his leadership. The Wizards have long needed a “floor general.” And many hoped that Gilbert Arenas would evolve into a vocal floor leader on the team but it never materialized. Just because a person is your most talented player, does not mean they have the mental makeup to be the team leader. Some people are just not suited for or comfortable in that role. So instead Antawn Jamison and Caron Butler took more active roles in team leadership. However, I believe there is a significant difference between being a vocal voice in the locker room and being a “floor general.” That job of floor general needs to belong to the point guard or other player who is responsible for initiating the offense. Conversely, I do not believe that it should belong to your best scorer. Antawn and Caron did not initiate offense, there job was to score. Those two players players passed the ball if and when they did not have a shot. And it was rare when they did not believe they had a shot. An initiator will make others better by getting them shots in places in which they can be most successful. …Wall and JaVale McGee ran a typical pick and roll that resulted in Wall throwing McGee a lob pass that should have been a dunk. Instead, McGee came down with the ball, took one dribble toward the other side, pivoted back to the same side he caught the pass, leaned away from the hoop and hit a fadeaway jump hook while drawing the foul. As McGee started his typical post-move celebration, Wall immediately ran over to him and shouted “COME ON! DUNK THAT S*** MAN!” A high-five soon followed, but the message was clear – just because the shot went in doesn’t mean the shot was the right one. I was thrilled to see John Wall get in McGee’s ear. Too often in recent years the young Wizards have passed up the easy, more fundamental play for the less fundamental and much more difficult one. They have long needed someone who was willing, able and best positioned to point these issues out to his teammates. And what is probably most encouraging is that the other players appear to be listening. I also feel compelled to contrast Wall’s behavior against players like McGee and Blatche. Flash back to last season, there were occasions when Coach Flip Saunders would pull Andray Blatche or JaVale McGee out of a game, typically for some breakdown in fundamentals. Both of these players have either walked past Flip (in the case of Blatche) or looked uninterested (in the case of McGee) when Flip was trying to provide them with instructions on what he wanted to see from them. Through two games in the Summer League, when Wall is not in the game, or during stoppages in play, he is with the coaches receiving whatever instruction the coaches are providing. Again, extremely refreshing behavior particularly for a team leader. While JaVale has made some progress – bulked up a bit and his wind appears to be a little better. He still has additional work to do in both of those areas. However, he still is biting on head fakes much too often. This was particularly evident in the Clippers game, when on one play, Nick Caner-Medley got him to bite on pump fakes twice making JaVale look as if he was on a pogo stick. While JaVale could use all the time he can get in order to work on his conditioning, I would like to see Hamady N’Diaye get more playing time. The lack of playing time makes me wonder if the Wiz will assign N’Diaye to the DLeague for a bit this season. While this is only Summer League, Trevor Booker is beginning to prove those Wiz fans, who complained about his selection, wrong. While his stats will not jump off the stat sheet he is proving to be what the Wiz thought he would be – a big body who rebounds, aggressively defends, can hit an open 12-18 foot shot, easily runs the floor and most importantly has some “dog” in him. They have long needed a big who has a bit of a nasty streak in him. The Clippers’ Sofoklis “Baby Shaq” Schortsanitis appears to be the Oliver Miller of Greece, except he bulkier at 340+ lbs and is less gifted offensively. He sets a hell of a screen though. NBA TV should consider using anyone other than Kevin McHale for color commentary, they can save him for studio work. 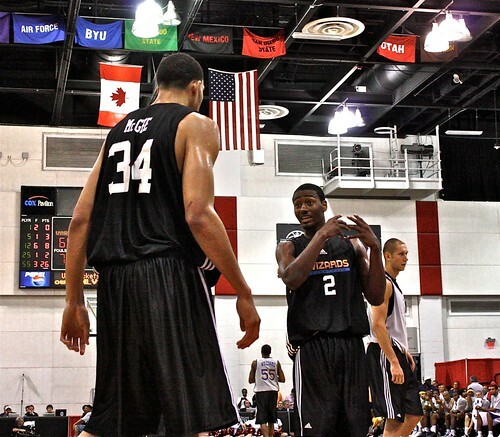 Can’t the NBA afford better Summer League uniforms? Or at a minimum can’t they find a vendor that produces tag-less, reversible jerseys? It looks cheap to see those little white tags sticking out from the top of the white-side of the jerseys. Hell, hire an intern to cut the darn tags. Ivan Carter reported on the Wizards Insider that Gil has agreed to accept in the neighborhood of $111 M over 6 years, which is approximately $16 M less than what the Wizards had offered. Assuming this plays out as reported, this is a great move for Gil Arenas and the team. The Wizards were able to lock up Gilbert for six years at a reasonable figure, and create some space for them to sign a player or two, now. I have to admit that I am a fan of Roger Mason, Jr. and would like to see him re-sign with the Wizards, but the team’s most pressing needs are for a back up big man, and a veteran small forward who can take some load off of Caron Butler. After his play in the playoffs, James Posey appears to be a perfect player to target, but half the league is also currently targeting Posey. In a previous post, I pointed out some potential inexpensive big men. Hopefully, by Gil accepting less it will allow the Wizards to sign a bargain center and possibly spend at or around the mid-level exception on a small forward. Once the dust settles on this agreement, we will be able to see exactly how much money the Wiz can spend on free agents, and which direction they go. P.S. I wonder if Gil feels even better that he did not have to pay an agent 10% to negotiate his deal with the Wizards? In hindsight, given what he said about staying with the team, it doesn’t seem like he would have needed an agent for this transaction. I am sure he paid some legal fees for his attorney to review the language, but it would appear that his decision saved him approximately $11 M.